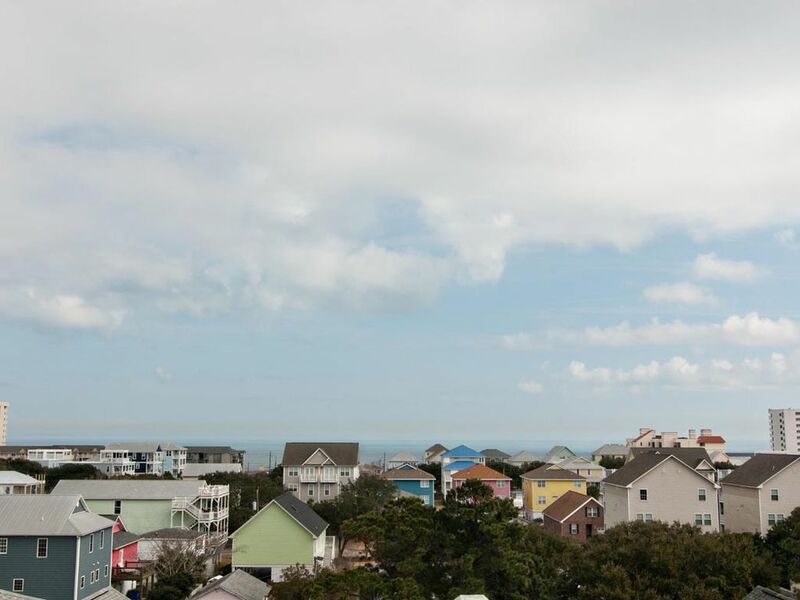 Vivez l'île Intérieur de Carolina Beach dans cette belle 6 chambres, 4. 5 salles de bain, 4 niveaux maison. Le niveau du sol dispose de 2 chambres: une avec un lit queen et l'autre avec un lit superposé-ensemble qui a une salle de bains commune. Le deuxième niveau comprend un salon ouvert, salle à manger, cuisine, et une chambre supplémentaire avec un lit queen et baignoire pleine grandeur. Le troisième niveau dispose de 2 suites de maître chacune avec une baignoire et roi privées lits. Le quatrième niveau dispose d'une chambre avec 2 lits simples, une salle de jeux avec une table Air Hockey et un futon que les virages peuvent être utilisés comme un lit complet. Chaque chambre dispose d'une télévision à écran plat. Il y a un veuves partagés à pied sur le 5ème niveau qui vous donne une vue panoramique sur l'ensemble de l'île. Cette propriété a aussi un côté clôturé et arrière-cour pour votre compagnon à quatre pattes membre de la famille. Emballez la famille et faire quelques souvenirs aujourd'hui. Interdiction de fumer. Sam à sam. WE ENJOYED THE PROPERTY FOR THE MOST PART. IT WAS CLEAN AND IN A GREAT LOCATION. THE ONLY THING IS THAT THE BATHROOM DOWN STAIRS DIDN'T FLUSH AND IT TOOK TWO DAYS FOR SOMEONE TO COME FIX IT BY OTHER THAN THAT IT WAS A GOOD STAY AND I WOULD STAY THERE AGAIN. I LOVED THE FACT THAT IT WAS DOG FRIENDLY. House was nice, clean, and spacious. We were all very pleased with our stay there! The kids loved the game room. The air didn&#x2019;t seem to keep up on the 3rd and 4th floor. It would get pretty hot during the day even if the air was going. The lower 2 floors stayed pretty cool. We didn&#x2019;t mind so much since we weren&#x2019;t there during the day. I would definitely rent again! We had 12 people in our party. 2 children, 1 teenager, 1 early twenty&#x2019;s, 3 married couples and to who have been widowed. The property says it sleeps 12-14, but it would have been nice to have a description of what each level has and how many stairs to get to the levels. The very top level that has the game room and two twin beds doesn&#x2019;t have a full bathroom. There is no shower and the counter space is very, very minimal. The house was clean which was appreciated. The location was fine, and the kitchen was well stocked with all the cooking appliances we needed. I would recommend this to people who do not have older people who need to climb stairs. The house is beautiful We had a couple of problems. The power was out the first night upstairs. Called that night wasn't fix until next day. The tub on main floor was clogged. That was fixed the same day. Other than that it was a enjoyable time for me and my family. Hi Rachel- thank you for your feedback! I am sorry to hear about the issues you had in the home, but am glad that we were able to fix them in an overall timely manner. Thanks again- we hope to see you back at the beach again soon! Nice big clean place. The ac gave us a few issues. The good news it was too cold not hot. Couldn’t get it to turn off but an hour or so later we were able to. The large dog and cage that takes up the WHOLE front porch with the owners next door is an issue. The dog barks if someone comes in or out. It uses the bathroom in the cage which smells. I’m not sure why the owner next door would not move the cage to the back yard???? We enjoyed our vacation at this house. The game room was a big plus for the grand kids. The kitchen was very well stocked and it was very roomy throughout the house. The master bedroom was beautiful and the beds slept good. I enjoyed the jacuzzi tremendously. The only down side was the dog barking beside of us. It was fine if you were not sitting out on the balcony. It was a short walk to the beach and it was a very well equipped house. We are glad you enjoyed your stay, and apologize for the loud 4-legged creature next door. We are very pet friendly at this beach, however, we do appreciate well behaved animals. We look forward to hosting you again and should you encounter a similar issue in the future, please let us know, we may be able to help provide some relief. Thanks again for the feedback and we look forward to hosting you again soon!